The walk starts off across typical hilly Cornish countryside down into the valley, then alongside the stream that leads out to the small fishing town of Penberth. A pretty town, where the newer houses have been kept in keeping with the style of the older original buildings. The beach is pretty but somewhat rocky, not good for a swim, but the slipway opens the transition between land a sea, with an old winch still used to pull the fishing boats ashore. There’s still a healthy trade going from this village, with line caught mackerel being the most popular catch, and fetching a good price for it’s ecological benefits along with the prestige of Cornish fishing. The walk up the cliffs from here is a bit steep, but is the hardest section of the day, and looking back into the cove offers some lovely views of the uniquely rocky cliffs and the town nestled between them. Along the top of the cliffs the views out to sea are impressive. In places along this route there are areas grazed by dartmoor wild ponies which can be fun to spot. It’s important not to feed these animals as they’ve been introduced to help the environment recover. They are friendly creatures, but try not to pet them, as they are wild and may not be completely safe. As you work towards Porthcurno you’ll pass the headland which is home to Logan Rock. The story is that two sailors decided to push this loose rock off the cliff, only to be caught and forced to take it back up. If you climb up to where the rock is sat you can see the holes they made to insert wooden bars to help them lift the stone back into position. The climb up there is not part of the walk, but is a great little detour that doesn’t take too long although the rocky bit can be a challenge to climb up. 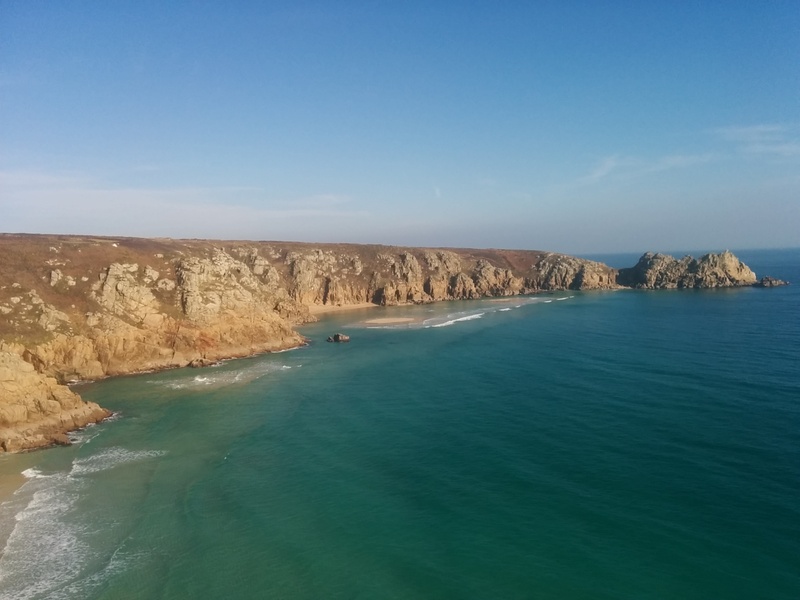 From the headland you can see down into Pedn Vounder, a stunning bay with huge stretches of sand. The way the cliffs and sand banks lie mean that at high-tide the water is still very shallow, turning the deep blue ocean to a gorgeous turquoise to rival the Mediterranean. This beach is usually quite quiet for a couple reasons, the walk to it is fairly steep and tricky, certainly not suitable for young kids and due to the lie of the sand it’s easy to get trapped by an incoming tide. Thanks to this it’s made the beach a bit of an unofficial nudist hotspot. While it’s easy to see down into the bay access is tricky enough to put off most, and the distance between the cliff tops and the beach is enough to prevent any embarrassment. There weren’t any naked people out when I walked past, but given the cold February air, I wasn’t surprised. it also meant my photos were unspoilt by anyone in the bay at all. From there it’s a short walk around the next head and down into Porthcurno. Another small town, but one with a lot more significance than most in Cornwall for two reasons. Porthcurno is the beach where the telegraph cables arrived in the UK. The telegraph network allowed messages to be sent trans-continentally within just a few days, rather than the weeks it took previously. The old method was simple mail, sent across on ships, but these cables stretched across the atlantic to improve communication between the colonies and London. There is a Museum a little further up the valley, but by the beach is the hut into which the cables ran, you can still look inside and see the various sources of the communications, some direct, and others via relay stations in friendly nations. The second is the world famous Minack Theatre, a spectacular stage and auditorium built into the cliffs, just visible from the beach. With the Atlantic as it’s backdrop, plays held here are impressive affairs, and while there are risks of numb bums and some rather damp shows (weather depending) the show will go on. The season starts in mid-Spring, through into Autumn, to make the most use of the daylight hours. With the brisk air, you’d have to be a very enthusiastic fan to want to sit in the freezing cold of winter with the wind across those cliffs. It’s an amazing place, even just for a visit, and the matinee shows are as popular as the evening as fans enjoy the summer sun. The town has a bit more to offer than just the Museum and Theatre, with a few good restaurants, boasting some excellent local fish dishes. It’s a pretty village as well, and a walk through is not unpleasant, however it does get rather busy in summer as the holiday lets and hotels fill up, and even more people come down to check out the sand. Our walk took us up the cliffs beside the Minack and onto the headland, from where we walked inland and across the flatter land. Farmers fields and backcountry roads led the way back to Treen and home.